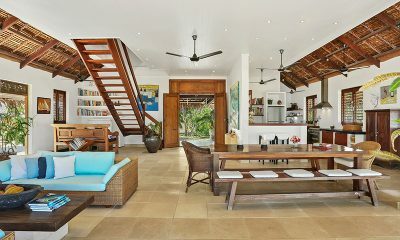 Villa Anouska is a beautiful beachfront villa with a light and relaxed beach house feel and turquoise views of the ocean. 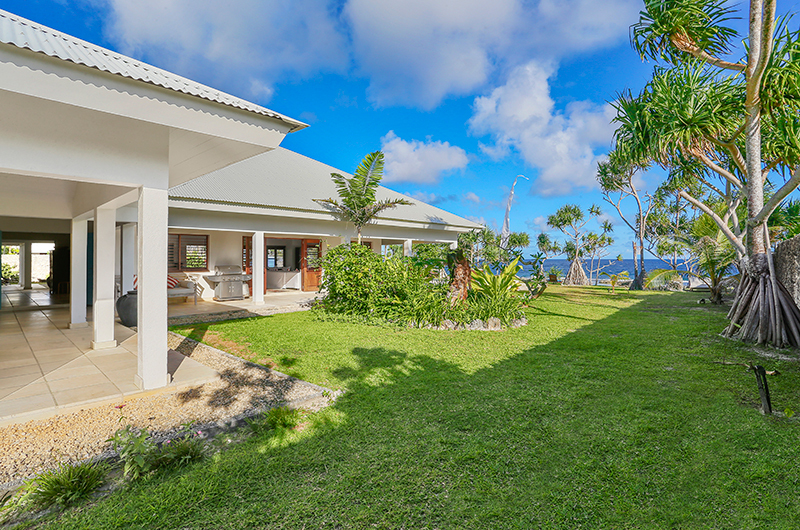 Villa Anouska offers a picture perfect location in Vanuatu, located directly on the beach with azure views of the Pacific Ocean. 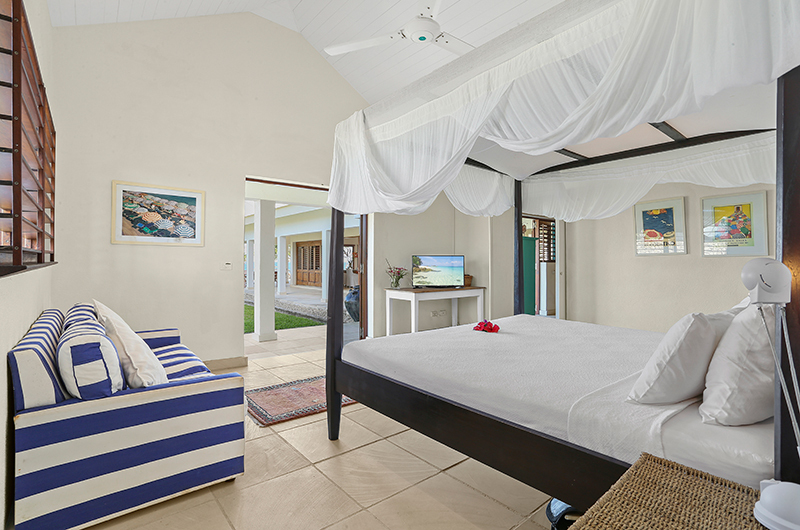 The four-bedroom villa was designed as a light and relaxed beach house with interiors done in fresh tones of white, red and blue, with nothing but a private swimming pool standing between you and the beach. Villa Anouska’s generous living areas and large gardens are ideal for hosting family get togethers and other relaxed gatherings, with a fresh ocean breeze playing in your hair. 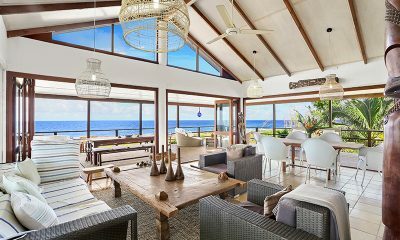 Villa Anouska captures the feel of a Pacific beach house with its nautical colour scheme and picture-perfect views looking out to the sea. 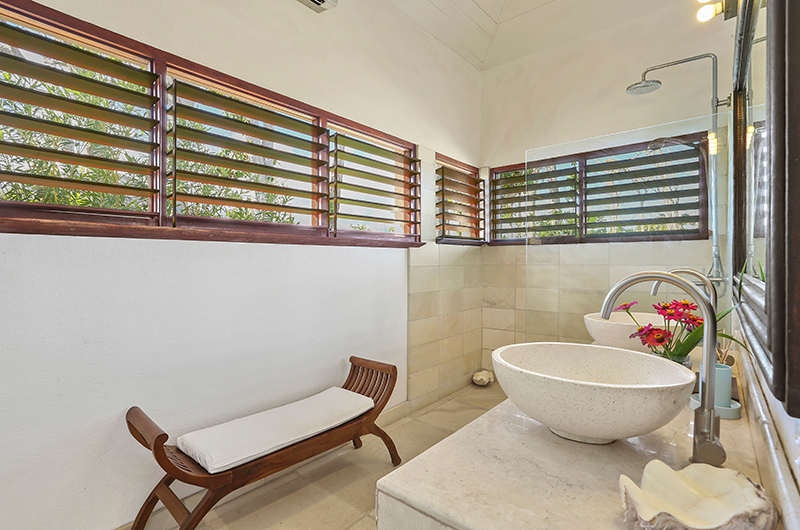 The dominantly white villa feels as light and fresh as the Pacific breeze blowing in from the beach. 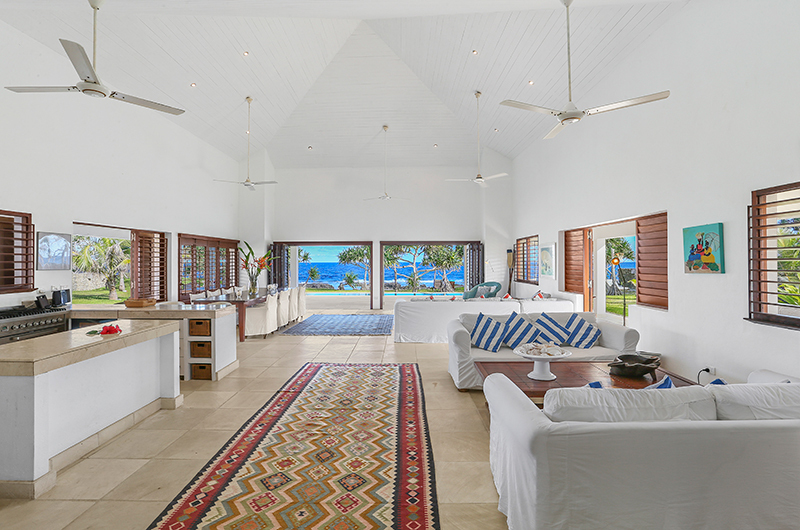 Allowing the fresh ocean breeze to enter the villa freely, the generous living area is flanked by bi-fold doors opening directly to the ocean views and manicured gardens. The living area includes two distinct seating areas. 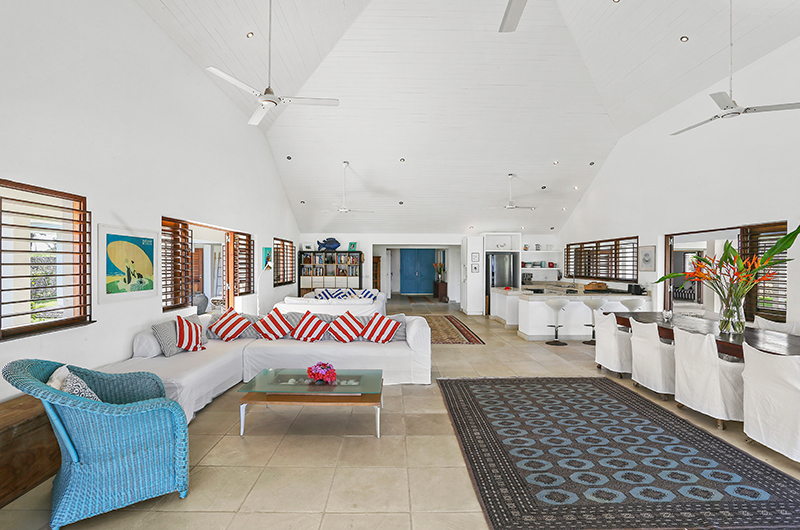 A large L-shaped sofa sits facing the ocean views, with two more sofas located to the back of the room offering a more intimate seating arrangement. In-villa entertainment is provided by a satellite TV hooked up to a DVD player. 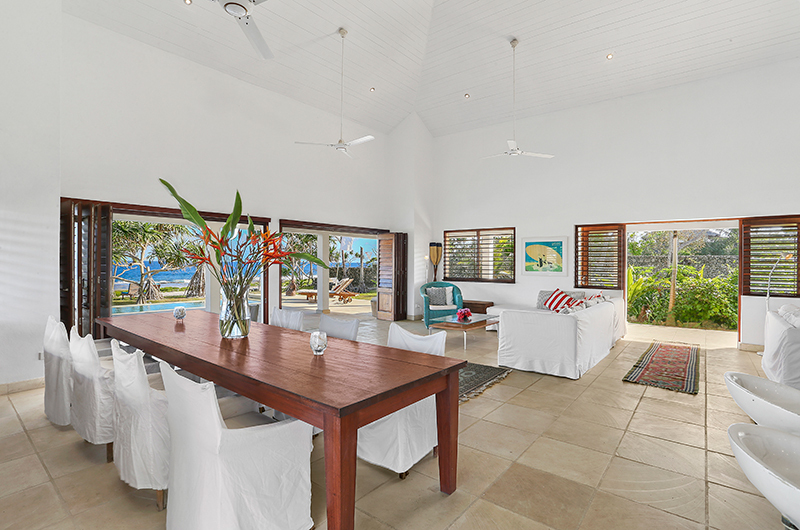 Designed for enjoying the good life, Villa Anouska includes several dining areas for guests to choose from. The indoor dining area features a wooden dining table flanked by eight chairs and followed by a modern kitchen equipped with all the essential appliances and crockery. The adjoining breakfast bar provides additional seating on high bar stools. Located on the outdoor veranda is an alfresco dining area with a six-seater table providing unobstructed ocean views. For a true once in a lifetime dining experience, enjoy a barbecue meal out by the beach in the shabby chic dining pavilion. 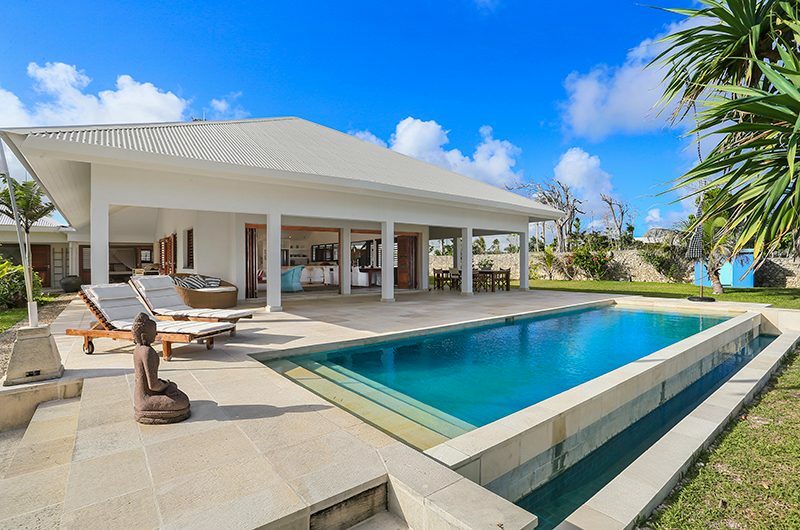 Villa Anouska boasts a superb beachfront location offering spectacular 180-degree ocean views from its private pool and garden. 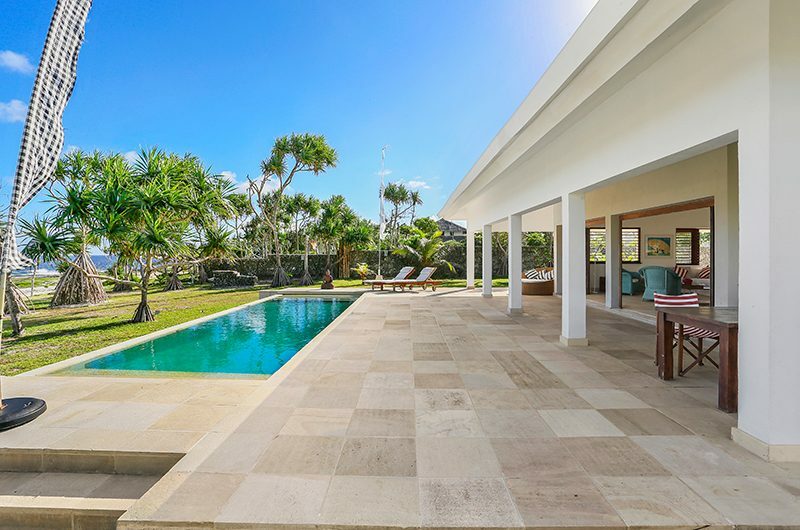 A few easy steps separate the villa from a private sandy beach highlighted by a naturally formed rock pool that’s safe and warm enough for children to play in. 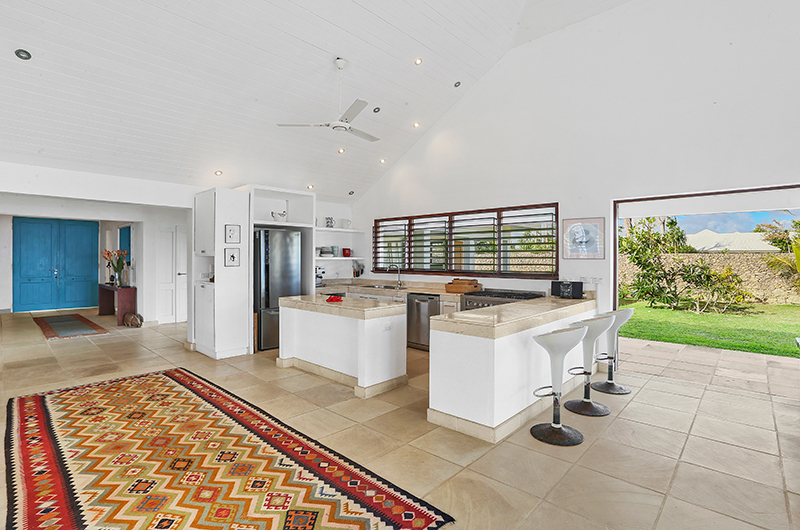 Villa Anouska has four bedrooms. 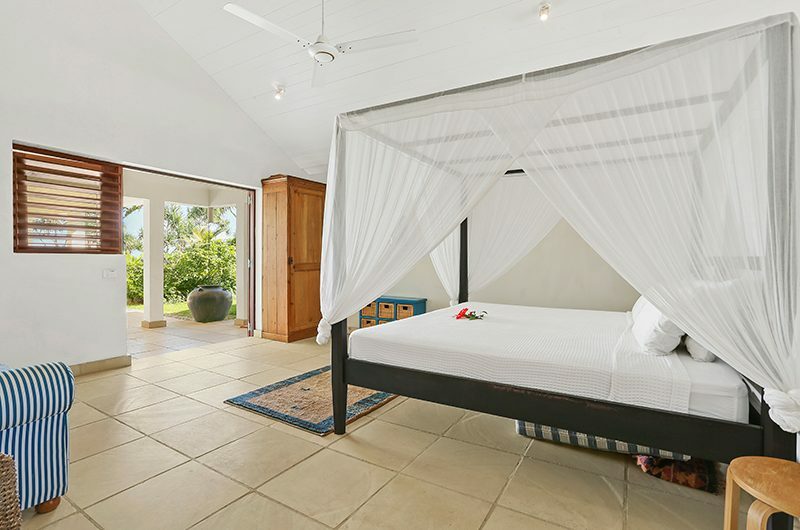 All bedrooms have four-poster king-sized beds with mosquito netting and come with air-conditioning and ensuite bathrooms. 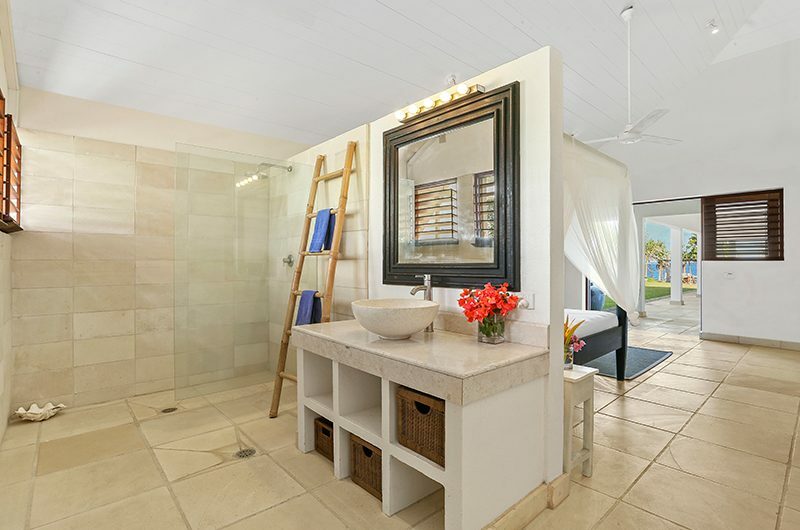 The master bedroom has a king-sized bed and an ensuite bathroom with a shower. 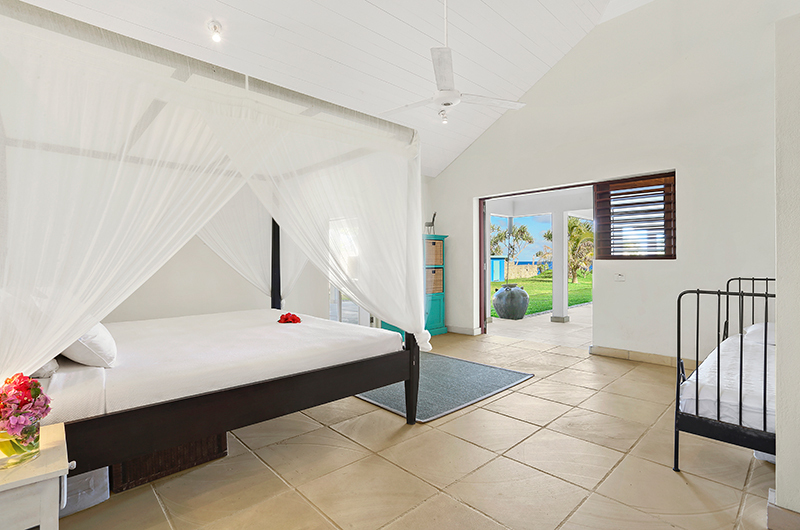 The second bedroom has a king-sized bed and an ensuite bathroom with a shower. Villa Anouska is a single-storey villa built over some 650 square metres of land. 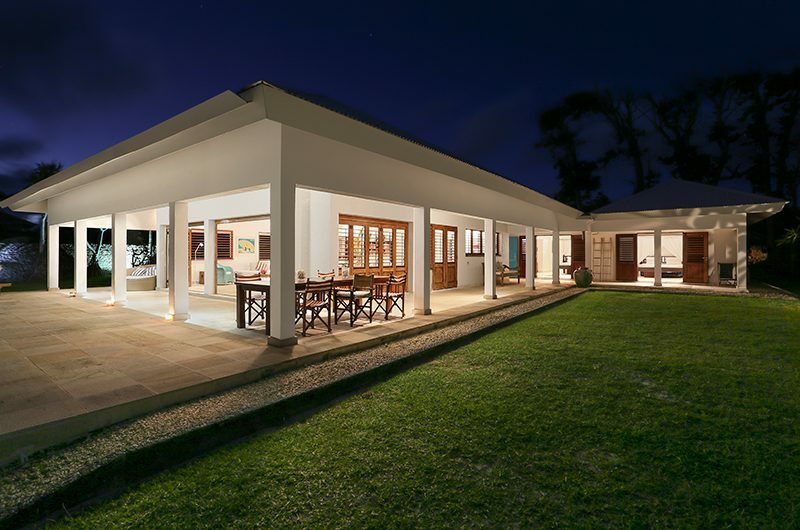 The villa includes four ensuite bedrooms, two living areas, a dining room, a fully-equipped kitchen and an open veranda with another dining area. The ocean facing gardens centre around a private swimming pool. 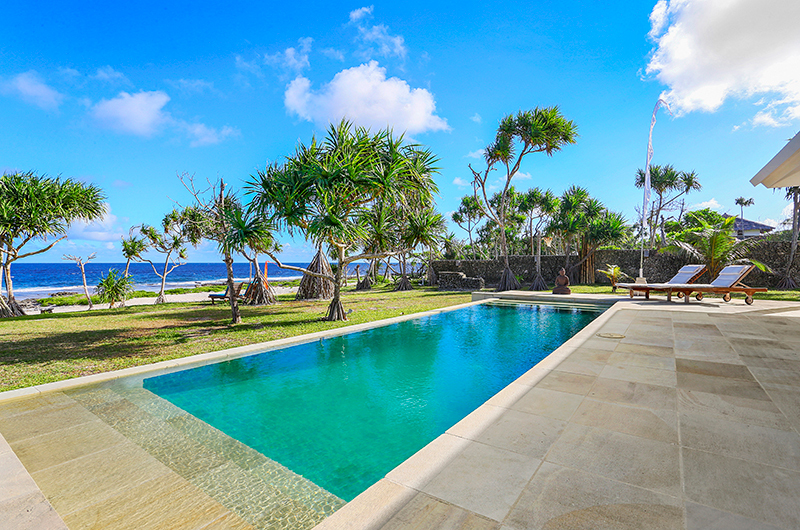 Villa Anouska is located next to Villa Sarangkita with three bedrooms and the two villas can be rented together to create a large seven-bedroom estate for big groups. Your stay in Villa Anouska is made enjoyable by the professional staff. Villa Anouska’s staff have been professionally trained and will do their utmost to please with their warm and friendly hospitality. 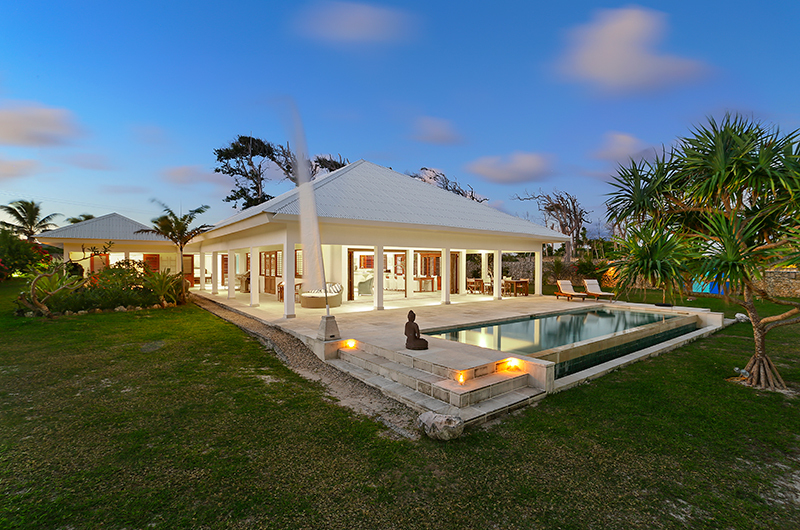 Villa Anouska’s experienced and knowledgeable manager is responsible for the overall operation of the villa. The villa manager will oversee and coordinate the staff and property and assist you during your stay. 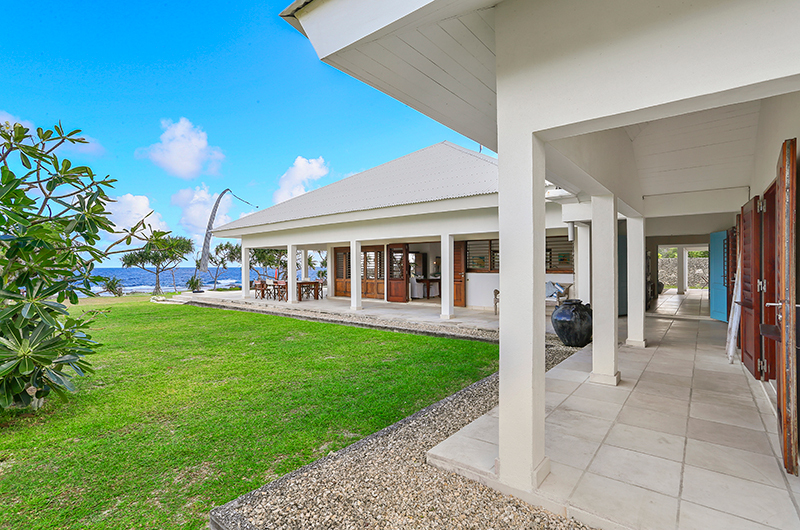 Villa Anouska is an absolutely beachfront villa located within a 20-minute drive from Port Vila, the capital of Efate island in Vanuatu. A walk down the beach will bring you to a couple of local eateries, including Ripples on the Bay and Tanamu on the Beach. The short drive over to Port Vila will provide access to even more dining options. 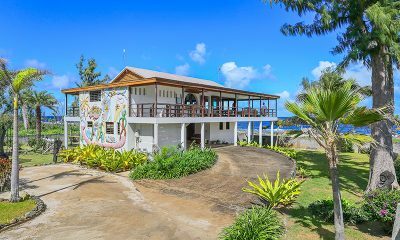 Villa Senang Masari is a modern beach house with unique Vanuatuan murals and direct access to the ocean lagoon. 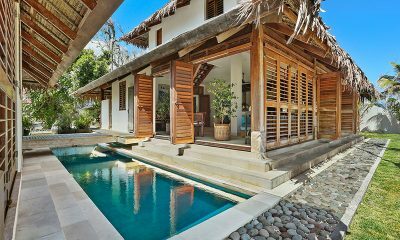 Villa Sarangkita is a relaxed beachfront villa with thatched roofs, a private pool and direct access to the beach.